Any country that has anything warmer that even a mild Mediterranean climate will be able to grow the fantastic Bougainvillea. And even in colder regions they can be successfully grown as a houseplant. What appear to be brilliantly coloured flowers are in fact papery bracts. The true flowers are almost insignificant, generally white, and in a cluster of three, but this doesn't matter as the bracts are so bright and persistent that they outlast and out-perform most other flowering plants - let alone other climbers! Bougainvillea are a genus of flowering plants native to South America from Brazil west to Perú and south to southern Argentina (Chubut Province). They are thorny, woody vines that will growing anywhere from 3 ft to 40 ft tall, and use their thorns to scrambling over other plants in order to reach the strongest sunlight. The thorns are sometimes strangely tipped with a black, waxy substance. Bougainvillea are relatively pest-free plants, but may suffer from worms, snails and aphids. The larvae of some Lepidoptera species also use them as food plants. Bougainvilleas grow best in dry soil, in very bright full sun, and with frequent fertilization. Before planting, dig in plenty of organic matter. 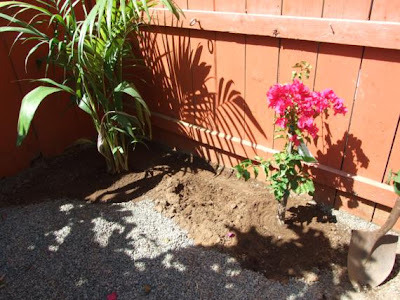 When choosing an area to plant your bougainvillea, remember that higher ground is best as water will drain away from the roots. They require little water once established, and in fact will not do well at all if over-watered. Be aware that the amount of watering needed to keep bougainvillea in tip-top condition is going to be directly related to the climate, soil type, plant size and weather conditions. Bougainvillea are drought-tolerant plants, and require very little water once established. As a rule of thumb, bring the soil to visual dryness between watering. You might be surprised to know that wilting is the best indicator that watering is needed, but don't leave you bougainvillea in that condition for too long. 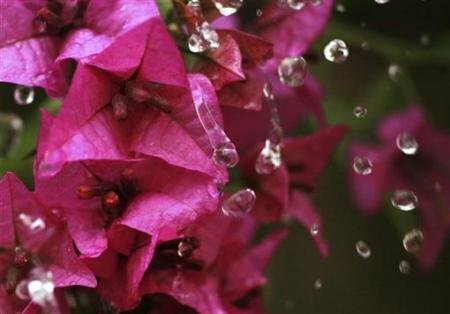 If you let your bougainvillea get bone-dry it will cause bracts and foliage to drop. When it is time to water, do so thoroughly – making sure that every inch of the root system gets watered.